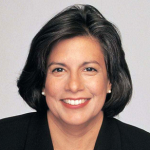 Susan Leal most recently served as Chief Strategy Officer and Senior Vice President for Water, North America at AECOM. She is a water utility expert and author specializing in identifying realistic and creative solutions to the water-related challenges. Prior to that, she was a Senior Fellow of the Advanced Leadership Initiative at Harvard University. As part of her fellowship, she co-authored Running Out of Water, a proactive book focused on solutions to our looming water crisis. She continues to serve as an Associate of the School of Engineering and Applied Sciences at Harvard. She is a member of the advisory board of the Department of Civil and Environmental Engineering at UC Berkeley, where she also received her BA and JD. Ms. Leal also sits on the Board of Governors of the Savannah Ocean Exchange and the Board of Futures Without Violence. As former General Manager of San Francisco’s Public Utilities Commission, Ms. Leal led the efforts for a dramatic upgrade of the Bay Area’s water system and outdated wastewater system. She previously served two terms as the elected Treasurer of the City and County of San Francisco and as a member of the San Francisco Board of Supervisors.